Calvin Bittner’s parents were JOSEPH / JOSIAH JOE / JOSIA BITTNER and his wife DRUCILLA BEAL. 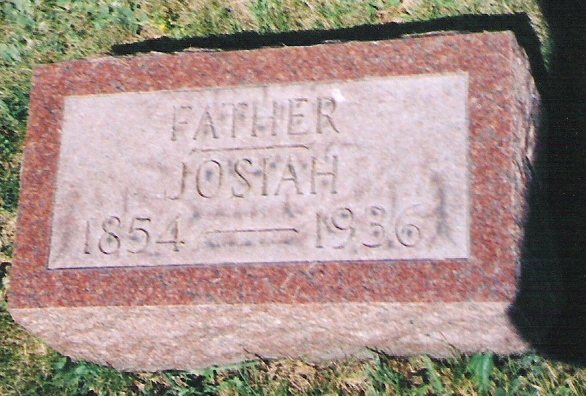 Joseph, the son of Franklin Bittner, was born Nov. 14 1854 and died May 15, 1936. 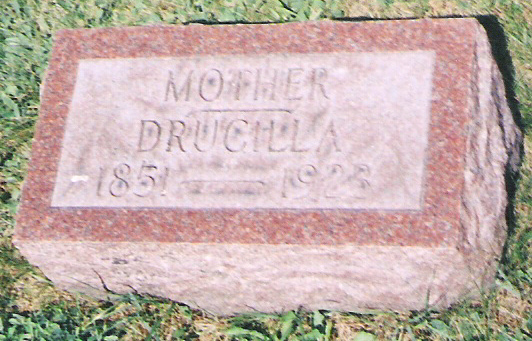 Drucilla was born July 6, 1851, and died Aug. 8, 1923. They were married Jan. 30, 1876. Funeral services for Joseph Bittner, 83, retired farmer of Larimer Township, who died last Friday at his home after an extended illness, were held on Monday in Temple Evangelical Church, near White Oak., with Rev. G.W. Sprinkle of Ellersly, Md., in charge. Interment in the church cemetery." L. Dietle's notes from a visit to St. John's United Methodist Church at White Oak in Larimer Township, Somerset County, PA. show the tombstones as "Father Josiah 1854-1936"; and "Mother Drucilla 1851-1923". Drucilla, Josia, Nannie D. and Allen F. are buried in a row. The tombstone for Nannie reads "Daughter Nannie D. 1888-1930" and for Allen reads "Son Allen F. 1881-1934". The following from is quoted from an untitled anonymous page from the Bittner File, Historical and Genealogical Society of Somerset Co..: "Josiah ___ Bittner, 1680, Sandpatch, Pa. at death, was b. Nov. 14, 1854 near Pocahontas, Pa., d. May 15, 1936, m. Jan. 13, 1876, Drucilla Beal who was b. July 6, 1851 near Pocahontas, Pa., d. Aug. 8, 1923, dau of Owen Beal and ___ ____ Farmer and cattle man. United Evangelical. Saint John's cemetery, near Sandpatch, Pa."
Calvin Bittner's daughter Mildred wrote the following on August 19, 1993: "Josiah was born 11/14/1854, died May 15, 1936, married January 30, 1878 Drucilla was born July 6, 1851 and died August 8, 1923. They had these children: Lilly, Howard, Calvin (my dad), Allen, Minerva, Edgar & Edna (twins) and Naomi." The 1912 book "Descendants of Jacob Hochstetler" provides the following information on Drusilla Beal as follows: Drusilla Beal was the daughter of Owen Beal and his wife Elizabeth Klingaman. "Drusilla Beal, Sand Patch, Pa., was m. to Joseph Bittner"